Revise the need for branching in programs. Must Create simple branching code, which is syntactically correct. Should complete the above, adding meaningful comments, look at if/else/elif. Could complete the above,understanding the concept of nested if statements, and also of the advantages of readable code using elif. When writing a program, we come to a point where we have to make decisions based on data and values within our code. 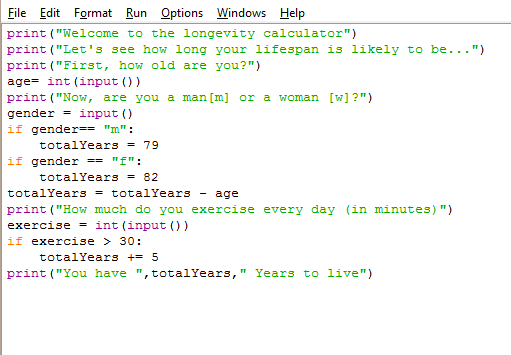 Now we’re going to build a program to calculate our lifespan. We all know that making healthy choices can prolong our life, while other choices are more harmful. Let’s get the computer to tell us just how much this may affect us. To begin with, the program will need to find the user’s age. We’ll save this information so that we can then calculate the number of remaining years. Next, the average lifespan for men (79) and women (82) is different, so our program needs to find out if the user is a man or a woman. The next is tougher. We’re expecting two possibilities, m or f. The program must behave differently depending on the result. If we run this code we don’t know if it works, as we can’t see the value of totalYears. Can you add a line to show us the value and prove that our code works? The line should include a dramatic message like “You have ** years to live”. Now a bit of Maths. You need to add a line which changes the value in totalYears. Why? the remaining years is our life expectancy less our age (years we’ve already lived!). Make sure the line you wrote for question 1 is after this one. Ok. Did you know that 30 minutes or more of exercise a day adds five years to our life expectancy? Of course, this is going to be slightly different, because we can only add the five years to the total if the user does more than thirty minutes! This is enough, as we don’t change the value for less than thirty minutes of exercise. If you eat fast food more than twice a month, you lose 1 years. If your code doesn’t work, make sure the line below an “if” statement is indented (pushed in from the start of the line). You can do this by pressing the TAB key (although it should do it automatically after typing the “if”. Your code is also getting quite complex now. You should write “comments”, explaining how your code works. These are typed after the “#” symbol. Python will ignore everything after that symbol. Ask the user about fast food, then add the fast food rule to your program, as written above. If you smoke, you loose 9 years. Ask the user, and change the total! If you eat 5 fruit and veg a day, you gain 7 years. If you drink lots of alcohol, you loose 15 years. If totalYears is less than 0, the program should print a message: “Your time is up!!”Extension. There are many other factors that affect our life expectancy. Conduct some research on-line, and add at least 4 more factors to your program. This code gets quite complex and long. Make sure you format (with comments, newlines etc) your code to make it as readable as possible. Could this be made any more light/readable/more robust using loops?